Rarely do I discover a game that does everything perfectly. The Frostrune is one of those few titles. Developed by Grimnir Media and published by Snow Cannon Games, it's a Point-and-Click adventure focusing on a thirteen-year-old girl who, after being shipwrecked on a remote island, must discover the island’s secrets and unravel its mysteries. The Frostrune’s atmosphere revolves around Norse mythology, and every aspect within the title draws from the mythos. As soon as you start playing, you feel a certain sense of wonder and mystery – a strong motivation to encourage you to begin exploring the area immediately. The absolutely gorgeous, hand-painted backgrounds are significant motivators as well . The art design uses a well-balanced combination of light and shadow, various colors, and attention to detail that makes the world seem mystical. The illustrations also give the world in-game depth and realism, despite being two-dimensional. While playing, I found myself stopping on each screen and not progressing in the puzzles or story, just to get lost in the beauty of the backdrop. It’s a world you feel compelled to discover. These incredible visuals are augmented by a rich and captivating soundtrack that harkens the Viking Age, and it adds to the sense of awe. There are parts of The Frostrune where there is singing, completely in Old Norse speech, and the singers are the spirits of deceased Nordic warriors. Each has a rich and powerful voice and sound magnificent as a solo, but all together they create a perfect harmony that will make you wish there was a downloadable soundtrack available. The rest of the voice acting, also spoken in Old Norse, is mesmerizing, drawing you into the lore and atmosphere even further. Control over subtitles is pivotal, because it allows you to be immersed in the spoken and written language of old Nordic culture while still being able to understand what’s happening. Collecting items and using them to solve puzzles. Many members in the genre use simple puzzles that don’t seem to have much to do with the story or atmosphere, but in The Frostrune, every puzzle is used to its utmost potential by being completely in line with Norse mythology. 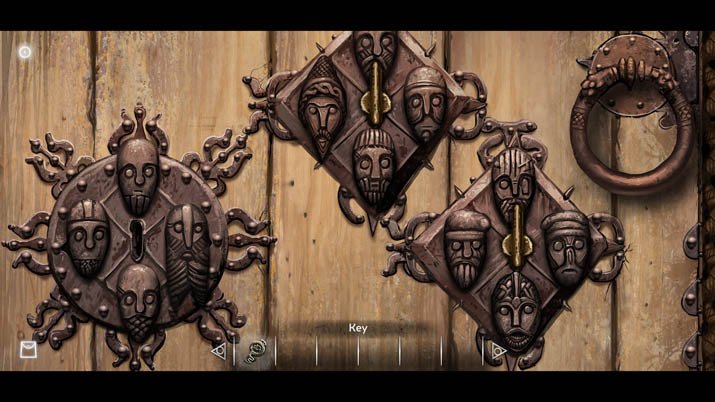 These puzzles get especially fascinating when you begin interacting with spirits and learning about traditional Nordic stories and folklore. In many point & click titles, the puzzles are either too simple or too challenging (usually too vague, with little to no explanation given), but here, Grimnir Media has reached a great middle ground between the two. Each puzzle is solved logically, but you must take time to think about how to solve it. The information needed to solve each puzzle is also well placed and given to you without making you feel like your hand is being held. For those who get stuck, however, there is a hint system available to use at any time that details each puzzle and interaction required to progress in the narrative. 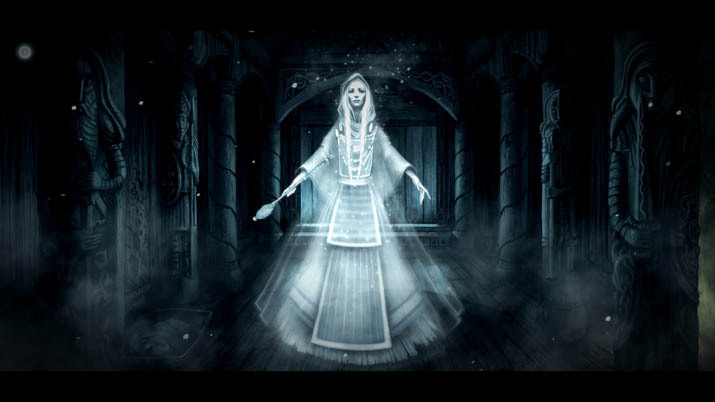 An interesting feature in The Frostrune is the ability to go back and forth between the spirit and physical world, and each has certain accessibilities that the other doesn’t. For example, you can only pick up and use items in the physical world, but you can only communicate with spirits and find some information needed to solve puzzles in the spirit world. This further adds to the mysticism and cultural richness of The Frostrune. Although it’s not very long (approximately 2 hours), The Frostrune is a magnificent spectacle from all angles: gameplay, art design, sound, and story. Each of these elements has been crafted with great finesse and works with the others fluidly to create an complete , immersive world. Where many games have strong elements, but these elements seem disconnected from each other, The Frostrune has everything connected and in tune with each other and feels like a complete and satisfying experience. Although I could easily continue gushing about its merits (and believe me, there are quite a lot of them! 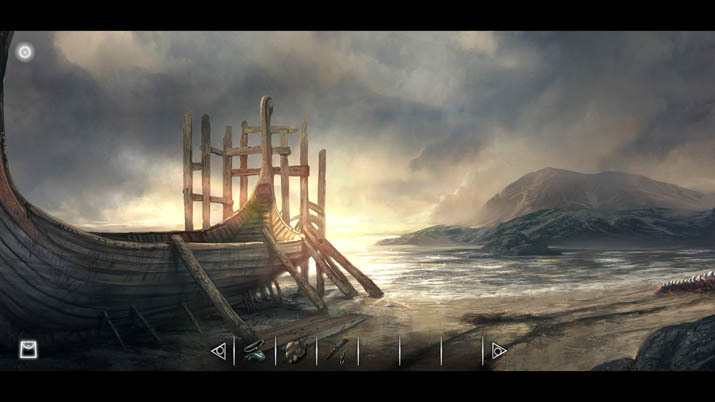 ), The Frostrune speaks for itself and stands out amongst its competitors as a crowning achievement in the point & click genre. For those who enjoy playing Point-and-Clicks or those interested in Vikings or Norse lore, this is an experience well worth getting.